Welcome to ATF's San Francisco Field Division. Representing one of the twenty-five ATF Field Divisions in the United States, our geographic area of responsibility encompasses Northern California, from the Oregon border to Bakersfield, and the State of Nevada. Our dedicated workforce is comprised of special agents, investigators, forensic auditors, technicians, support staff and contract workers. Read more about the San Francisco Division. 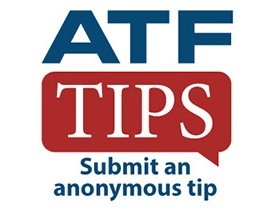 Text the code ATFSFO to 63975 and then follow the link to create a report.